I’m a bit slow getting geared up for Christmas this year. It’s hard to think about the festive season when you are woken up by birdsong every morning, another day of 80 degrees of sunshine stretching ahead of you. There is just not much of a Christmas atmosphere in Johannesburg, which people have fled in droves to spend their summer breaks somewhere else, partying on a nice beach, most likely. We ourselves have just come back from a fabulous week in Mauritius, which is one of the most beautiful places on Earth. So for once I’m not feeling very stressed about my Christmas to-do list, even though daunting questions beckon, like how can you get all those presents without Amazon, will your Christmas lights work with 220 volts, and where on Earth do you find a Christmas tree in Johannesburg? Maybe I’ve embraced The African Way more than I realize. I’ve cursed the exhausting and frustrating “Welcome to Africa” side of it, which those of you reading this blog will have heard plenty about. But there is also a very relaxing and beautiful side to the African mentality. It is the idea of living the day, of taking time to smile, of stopping what you’re doing to have a chat or to play a game, of helping others even if that delays your plans, the spirit of Ubuntu or togetherness. It teaches you that most things we’re so worried about aren’t really that important, that in fact we ourselves aren’t that important. I’ve just finished a book called “A Life of Being, Having, and Doing Enough” by Wayne Muller, and while not at all about Africa, it essentially has the same message. I can highly recommend it. So, I’ve decided life will probably go on even if I strike about half of the items off my Christmas list. As for the tree, my first plan was to just wait for it to magically appear at the Fourways intersection, where so many useful (and more often useless!) things are hawked by enterprising street vendors. But then a friend gave me a cell phone number and a name, and lo and behold, we came home with a real tree today! Well, let me qualify that a little bit. 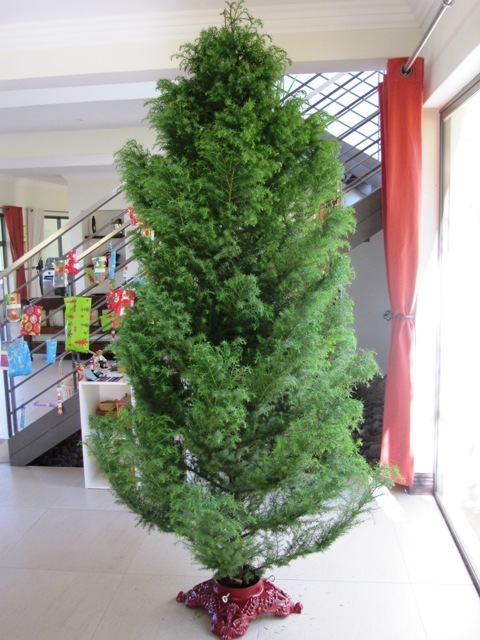 Coming from Durban, which apparently is the place for suitable Christmas trees, it is a Japanese Cedar. If you’ve ever seen one, it is a bit on the spindly side with a thin trunk and floppy branches (which had the bonus of making it fit very easily into our car). I’m trying to picture all our ornaments on it, and it does not seem feasible to accomplish that without the whole thing keeling over. It’s trying hard enough to stand on its own without any additional weight. Still, it is a real tree, which not many people in Joburg have, so I’m happy we’ve got one.